Gnocchi alla Romana (Roman-style semolina dumplings) are disk-shaped dumplings made from a fine cornmeal flour called semolina. The semolina is combined with milk and salt and cooked into a thick porridge. Butter, egg and cheese (and sometimes herbs) are then blended in. Once the disks are formed and chilled, they are layered like rooftop shingles in a pan then baked. 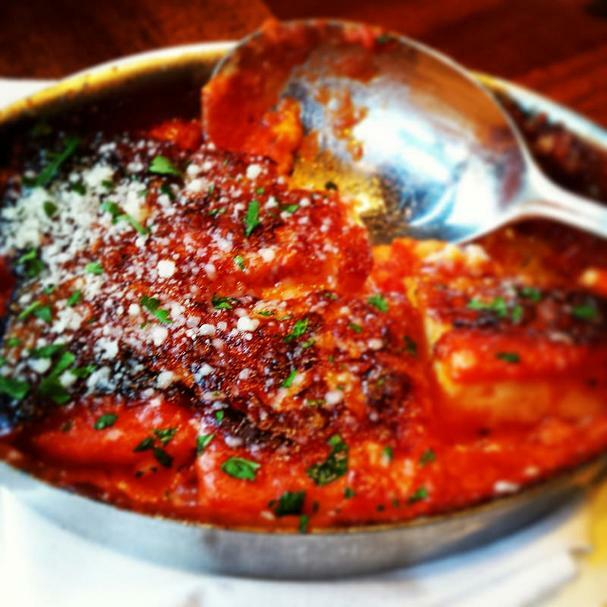 Some recipes simply brush the gnocchi with butter and bake with a topping of parmesan cheese, other versions, like ours, are covered in a velvety tomato sauce. Our favorite basic tomato sauce recipe comes from Marcella Hazan, the grand dame of Italian cooking. Her sauce is a simple blend of tomatoes and onion with the addition of butter. Butter may seem an unusual ingredient to put in tomato sauce, but it will elevate your sauce, making it decadently rich and velvety! Preheat oven to 400°F with rack placed in the middle. Heat milk and salt in a medium saucepan over medium-low heat until bubbles begin to form around the edges of the pan. Slowly whisk in semolina, reduce heat to low and cook, stirring frequently, until the mixture becomes very stiff and starting to pull from the sides of the pan, about 5 - 8 minutes. Remove from heat and let cool about 5 minutes. Stir in 3 tablespoons butter and the beaten egg and stir until well combined. Next, stir in 3/4 cup Parmigiano-Reggiano and baking powder until incorporated. Fill a small bowl with water. Moisten a 1/4-cup dry measuring cup with water and scoop out an even portion of semolina mixture. Invert onto a sheet pan or large plate and repeat, moistening cup with each gnocchi. Place in refrigerator, uncovered, for at least 30 minutes or up to 24 hours (covered). Meanwhile, make the tomato sauce. Place ingredients in a saucepan and cook, uncovered, at a low simmer for 45 minutes, or until the fat floats free of the tomatoes. Stir occasionally, mashing any large bits of tomato with a wooden spoon. Remove and discard the onion; taste and correct for salt. Remove chilled gnocchi from refrigerator and arrange, slightly overlapping, in a well-buttered 10-inch round skillet (or an 8-inch square baking dish). If using a round vessel, start arranging from the outside first, followed by another circle within. If using a square dish, arrange in rows. Top with tomato sauce and sprinkle with remaining 3/4 cup Parmigiano-Reggiano. Bake in middle of oven for 30-35 minutes. Let stand 15 minutes before serving. Garnish with grated Parmigiano-Regiano and freshly chopped flat leaf parsley.